Since 2003, CSS has assisted the Bureau of Engraving and Printing (BEP) Eastern Currency Facility with implementation and management of its occupational safety and health programs. BEP produces the nation's currency using a variety of intaglio and offset printing processes. These processes utilize numerous proprietary inks that contain aliphatic and aromatic solvents; some emit aldehydes as part of the curing process. 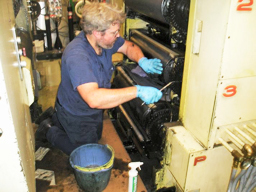 In addition, the routine cleaning and maintenance of printing equipment requires the use of industrial cleaners and degreasers that also contain a variety of aliphatic and aromatic solvents. CSS provides routine safety and health support services to BEP (e.g., compliance inspections, industrial hygiene surveys, noise surveys and dosimetry, training, and program development), and also has performed numerous special chemical exposure assessment projects. An example of one large-scale exposure assessment project was the characterization of aldehyde and organic solvent exposures among approximately 300 currency production employees. CSS industrial hygienists organized the exposure assessment by establishing similar exposure groups for production employees based on similarities in the type of equipment used, the types of work tasks performed, the chemical products used during work tasks, and the extent and duration of chemical product use. Personal solvent and aldehyde samples were collected from randomly selected individuals within each similar exposure group and the results were statistically analyzed for compliance with short-term and full-shift occupational exposure limits. The results of the assessment indicated that production workers were not exposed to organic solvents and aldehydes in excess of occupational exposure limits but there were materials/products identified that contributed significantly to employee exposure. These results initiated the search for less toxic product alternatives that were subsequently identified and successfully integrated into the current BEP currency production processes.